The secret is to have exposed soil. If you have exposed soil, even in your yard, simply sprinkle seed on the soil and let the frosts work it in. If the ground is thawed, you can step on the seed or roll it to improve contact. It would make sense to use a similar seed variety in your lawn when planting grass because some cultivars have different visible characteristics, although perennial ryegrass would have the highest probability to have the best germination. For farmers, frost seeding works as well. Pasture and hay fields that have thin stands and exposed soil are good candidates for frost seeding. The seed that works best is clover. Medium red clover is the cheapest seed and works well. Other clovers will also work. Simply apply 3-10 lbs. of seed per acre, and let mother nature take her course. Some steps to improve germination include mixing fertilizer with the seed as the fertilizer will scratch the seed coat and improve germination. Keep in mind that when you apply this mixture with a “spinning seeder”, fertilizer will travel twice as far as the seed. Some have had success letting livestock tramp in the seed with their hooves. A light grazing of fields when grass starts growing will keep down competition as the clover starts. In general, legumes or clovers work better for frost seeding as compared to grasses. This might be because legume seeds are typically heavier than grass seed and that may help them get down to the soil level better than grass seed. The advantage to frost seeding a legume such as red or white clover is that legumes “fix” nitrogen typically in excess of their own needs. The existing grass plants use the excess nitrogen, which improves their quality as a feedstuff. Once legumes become established in a stand of pasture grass and compose 25-30% of the stand, there is no need to apply supplemental nitrogen so this portion of fertilizer costs is reduced. 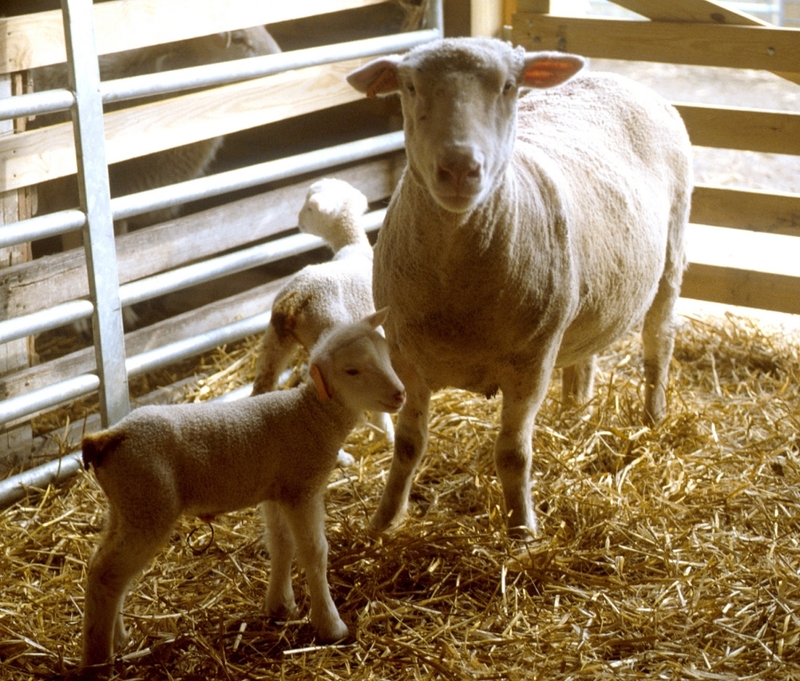 As a final note, remember that when seeding a legume that has not been grown in the pasture for a number of years, it is a good idea to include the proper bacterial inoculum with the seed to insure that the bacteria responsible for fixing nitrogen becomes associated with the plant roots. Grasses do not generally work as well as legumes to establish through frost seeding, although in some of those pasture fields that have been trampled and beat down, the possibility for success should be greater than in conditions of a thicker sod. Frost seeding trials have indicated that perennial and annual ryegrass is probably the best choice for frost seeding followed by orchardgrass. My preference, given the increased seed prices we have seen in the past couple of years, would be to stay away from frost seeding grass and use a no-till drill as the preferred seeding method. Once the decision has been made to frost seed, and the forage species selected, the producer must think about timing and seeding rate. Generally, from mid-February through mid-March is a good time to frost seed. Of course, if there is a good snow cover on a hillside that you desire to frost seed, you may want to wait until the snow has melted or your seed may end up being carried down the hill. 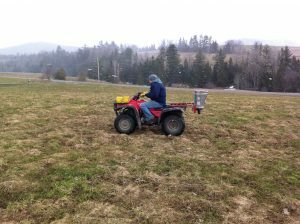 Frost seeding is a low-cost seeding method that can allow livestock producers to renovate pastures by increasing the legume content of the pasture and moving some improved genetics into the pasture mix. The end result can be a more productive, higher yielding pasture that requires less synthetic nitrogen inputs. ← Do Sheep and Goats get Cold?